John “Jack” Grayburn was a Chiltern RFC First XV player in 1939 on the outbreak of World War 2. In September 1944 as part of Operation Market Garden, he was the officer in charge of 2nd Platoon, Parachute Regiment, which gallantly but desperately battled to hold Arnhem Bridge. He was killed on the bridge and posthumously awarded the Victoria Cross - the UK’s highest gallantry medal. 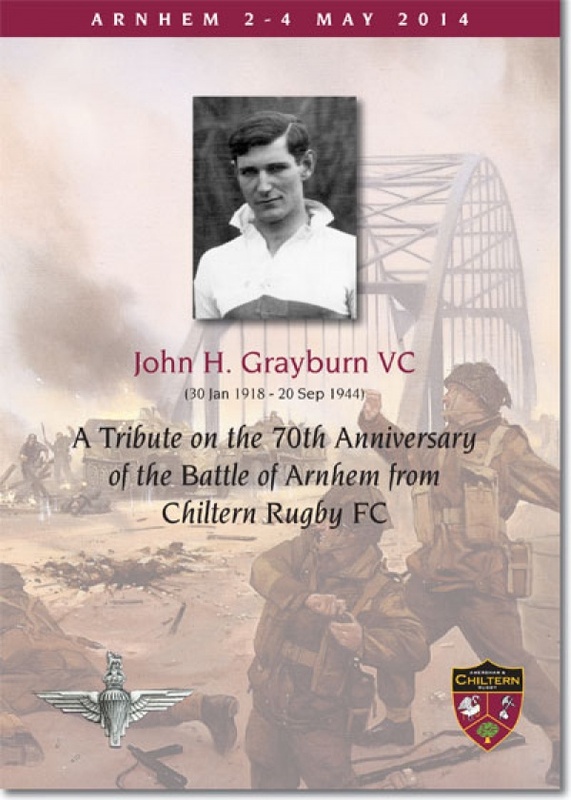 On the seventieth anniversary of the Battle for Arnhem, Amersham & Chiltern Rugby decided to undertake a first ever Club Tour to Arnhem to pay tribute to Jack Grayburn VC. War Office, 25th January, 1945. Lieutenant John Hollington Grayburn (149002), Parachute Regiment, Army Air Corps (Chalfont St. Giles). For supreme courage, leadership and devotion to duty. Lieutenant Grayburn was a platoon commander of the Parachute Battalion which was dropped on 17th September, 1944, with the task of seizing and holding the bridge over the Rhine at Arnhem. The North end of the bridge was captured and, early in the night, Lieutenant Grayburn was ordered to assualt and capture the Southern end with his platoon. He led his platoon on to the bridge and began the attack with the utmost determination, but the platoon was met by a hail of fire from two 20mm. quick firing guns, and from the machine guns of an armoured car. Almost at once Lieutenant Grayburn was shot through the shoulder. Although there was no cover on the bridge, and in spite of his wound, Lieutenant Grayburn continued to press forward with the greatest dash and bravery until casulaties became so heavy that he was ordered to withdraw. He directed the withdrawal from the bridge poersonally and was himself the last man to come off the embankment into comparative cover. Throughout the next day and night the enemy made ceaseless attacks on the house, using not only infantry with mortars and machine guns but also tanks and self-propelled guns. The house was very exposed and difficult to defend and the fact that it did not fall to the enemy must be attributed to Lieutenant Grayburn’s great courage and inspiring leadership. He constantly exposed himself to the enemy’s fire while moving among, and encouraging, his platoon, and seemed completely oblivious to danger. On 19th September, 1944, the enemy renewed his attacks, which increased in intensity, as the house was vital to the defence of the bridge. All attacks were repulsed, due to Lieutenant Grayburn’s valour and skill in organising and encouraging his men, until eventually the house was set on fire and had to be evacuated. Lieutenant Grayburn then took command of elements of all arms, including the remainder of his own company, and re-formed them into a fighting force. he spent the night organsing a defensive position to cover the approaches to the bridge. On 20th September, 1944, he extended his defence by a series of fighting patrols which prevented the enemy gaining access to the houses in the vicinity, the occupation of which would have prejudiced the defence of the bridge. This forced the enemy to bring up tanks which brought Lieutenant Grayburn’s positions under such heavy fire that he was forced to withdraw to an area farther North. The enemy now attempted to lay demolition charges under the bridge and the situation was critical. Realising this, Lieutenant Grayburn organised and led a fighting patrol which drove the enemy off temporarily, and gave time for the fuses to be removed. He was again wounded, this time in the back, but refused to be evacuated. Finally, an enemy tank, against which Lieutenant Grayburn had no defence, approached so close to his position that it became untenable. He then stood up in full view of the tank and personally directed the withdrawal of his men to the main defensive perimeter to which he had been ordered. He was killed that night. From the evening of September 17th until the night of September 20th, 1944, a period of over three days, Lieutenant Grayburn led his men with supreme gallantry and determination. Although in pain and weakened by his wounds, short of food and without sleep, his courage never flagged. There is no doubt that, had it not been for this officer’s inspiring leadership and personal bravery, the Arnhem bridge could never have been held for this time.